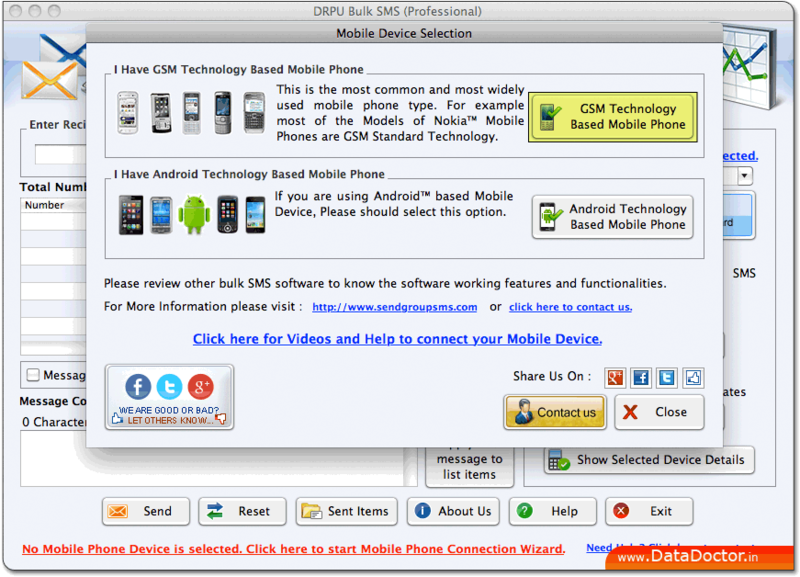 Mac Bulk SMS Software – Professional is designed to broadcast unlimited text messages from Mac OS X installed PC via connecting with GSM or Android technology based mobile phones. Software sends bulk number of text messages, alerts, promotional messages and notifications over worldwide location without requiring internet connection. Macintosh SMS broadcasting program broadcast mass SMS with facility to skip duplicate number entries and support all major GSM or Android technology based cell phones. Software provides delayed delivery option to control and customize message sending load. » Send unlimited text messages without use of internet connection. » Exclusion list wizard option helps to maintain list of contacts by excluding group of contacts. » Allow user to send messages and notifications to any contact number. » Provide option to send message that contains non-English (Unicode) characters.